This recycled bag features a new stitch design that I added for a new look to my latest reusable bag. I call this stitch the Picket Stitch. 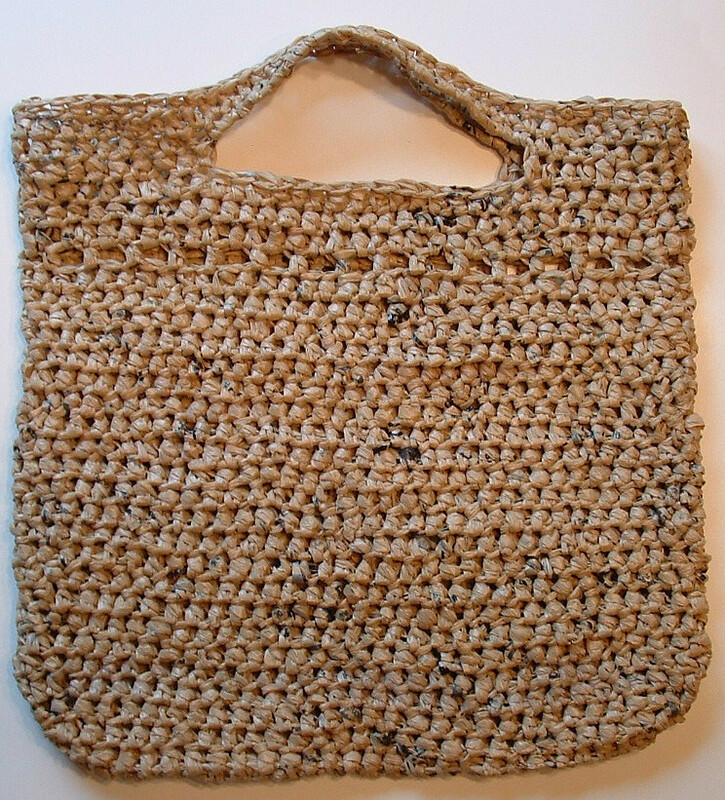 I have used a similar stitch idea in my picket fence dishcloth pattern and thought it would be interesting to use on a tote bag pattern. 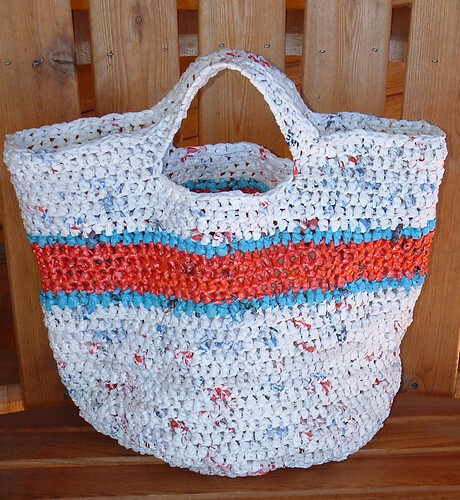 It adds a different look and I’m always trying to come up with new ideas for dressing up my recycled bags. 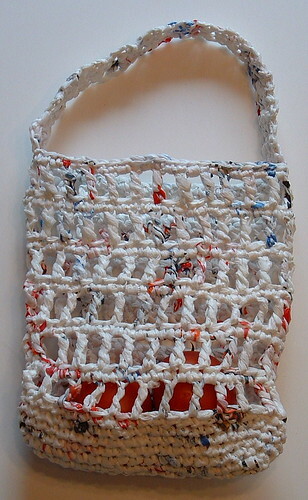 Here is my newest recycled bag. It’s a round grocery tote that I crocheted with plastic bags made into plarn yarn. 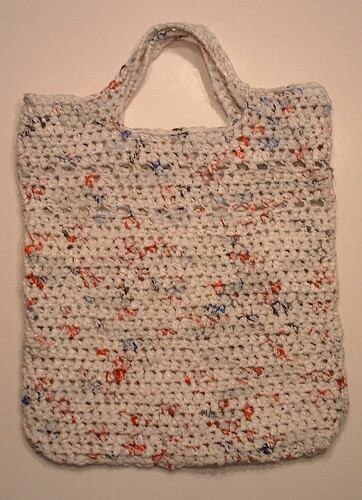 I designed this recycled plastic tote to be roomy and to replace my favorite reusable grocery tote that is disintegrating. My favorite grocery tote is going to have to be retired as it’s just falling apart after years of use. 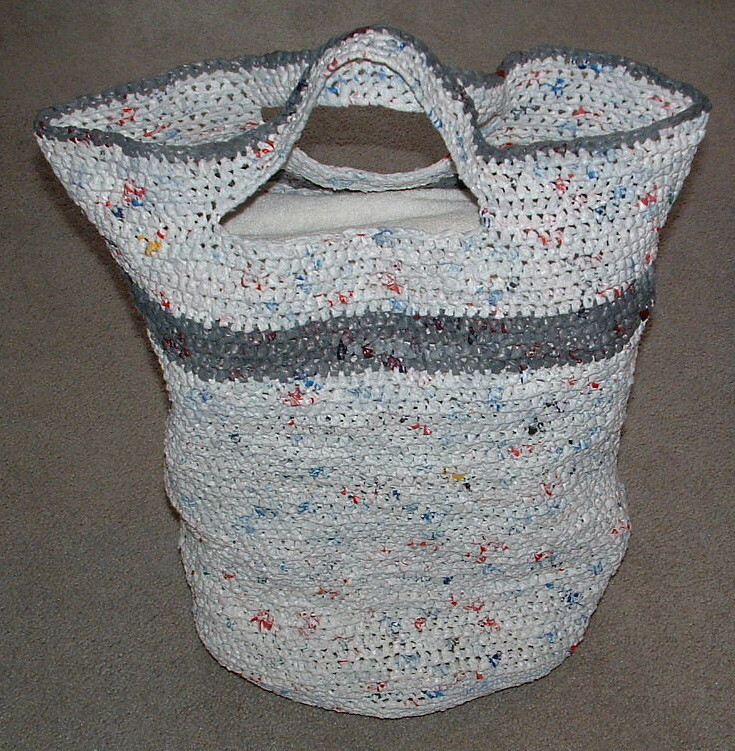 Anyway I love the big round base of this reusable tote. The stripes add a cheery look to the design. I added thick heavy handles and this grocery tote should service me for many years. I have written up the free crochet pattern below and hope you too can make yourself a useful tote bag for your trips to the market. 12 pink newspaper bags and 7 blue bags cut into plarn also for the stripes. 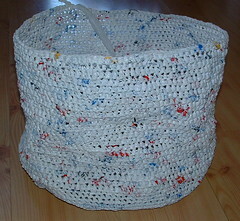 Here is my picture tutorial link on how to make plarn yarn from the different plastic bags. A gingham pattern is very unique when you crochet it. I decided that I would try the idea using plastic bags made into plarn. I used recycled white, grey, and black plastic bags for the project. 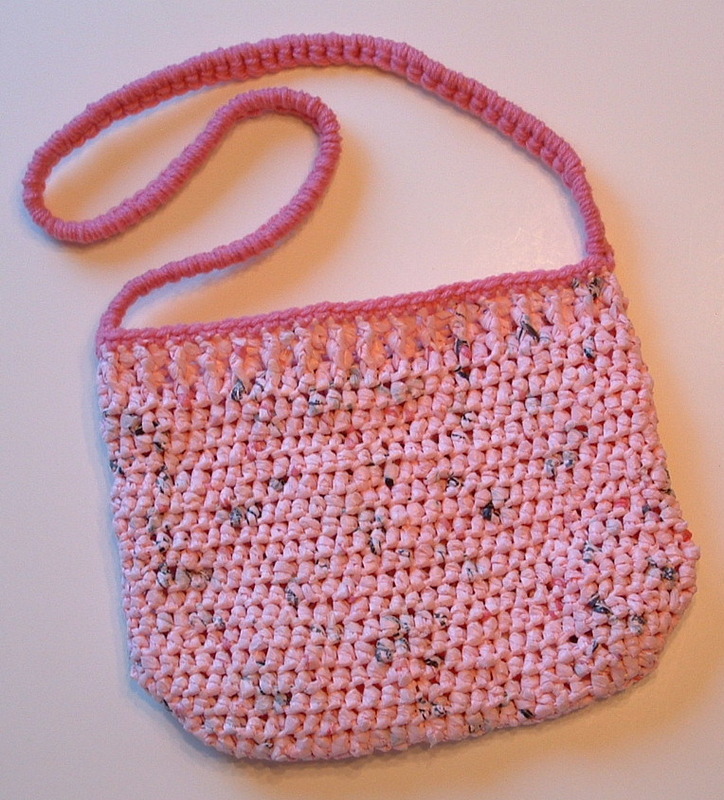 This idea came from Delights-Gems gingham crochet tutorial for crafting a potholder. Click on the link to see Delight’s picture tutorial that is very helpful in working the gingham pattern. 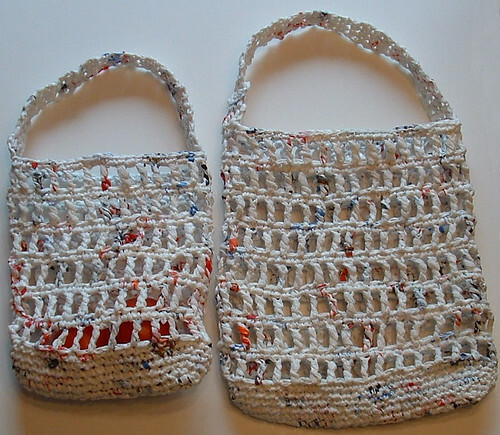 I made a few changes for the plastic bag version of gingham pieces which I will outline below in the pattern details. 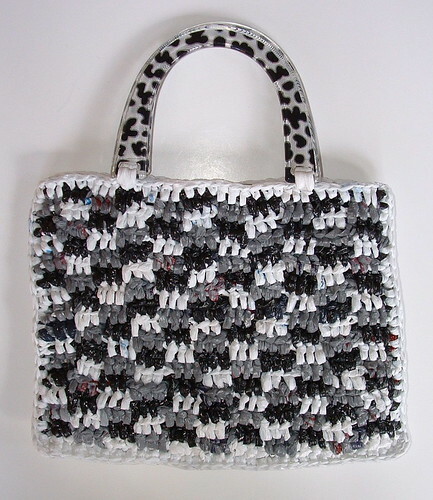 White, grey, and black plastic bags cut into 1 inch wide plarn. Approx. 12-15 bags of each color needed. 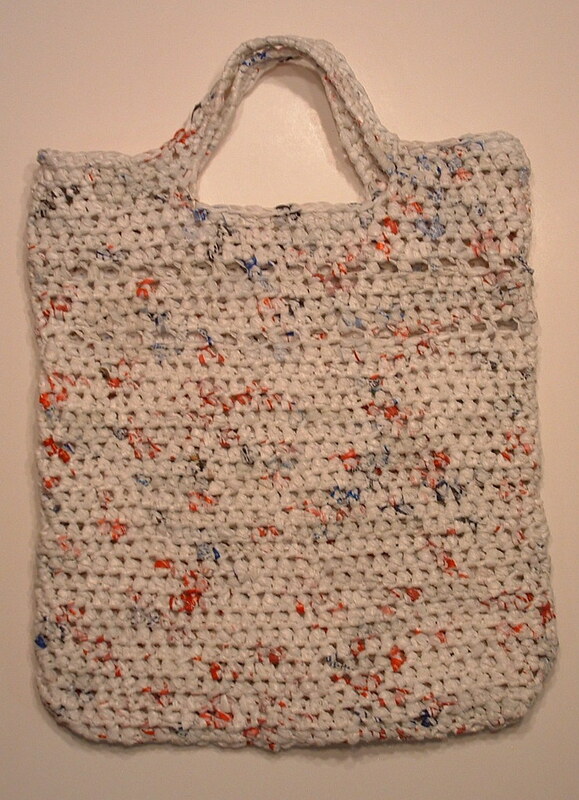 Here is my plastic bag picture tutorial if you need more information on how to create yarn from recycled plastic bags. 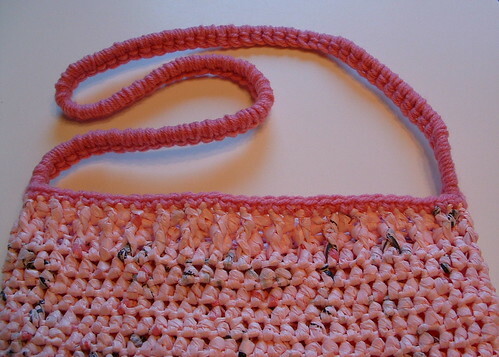 The three colors of plarn is needed to complete this purse. I found it worked easier to assemble short strands of the colors rather than using big balls of each color. The colors don’t get tangled up if you have just short lengths of “yarn” as you leave the dropped colors attached as you work the gingham pattern. Several people have asked for a picture tutorial on how I lined my pink passion plarn purse. So here are a few pictures I took and I will walk you through a brief explanation on how to line a plarn purse. I basically create a pocket to slip inside my plarn purses to line them. I simply cut a piece of fabric for the lining and with right sides together and sew it together. 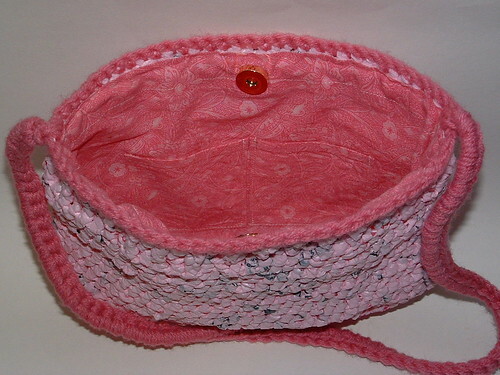 Here is the completed lining I made for the recycled Pink Passion Plarn Purse which includes two pockets and a magnetic closure. I don’t normally share a project in progress but this crocheted laundry basket is just such an enormous project that I have to post about it even though it’s not completed yet. I’m guessing its about half finished and I believe I’ve used already over a hundred recycled plastic bags. 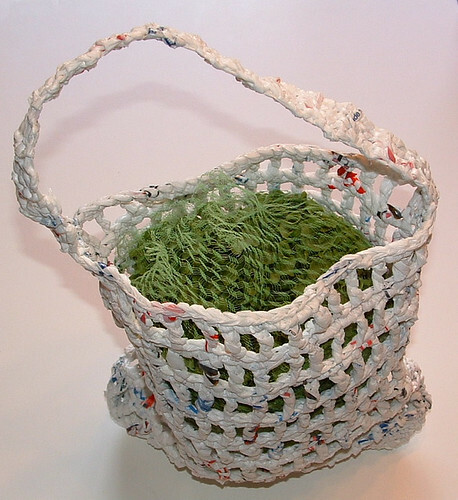 I have had a recycled plastic bag or plarn laundry basket on my to-do list for a long time. I eventually get around to creating most of the things on my list but it does take time. 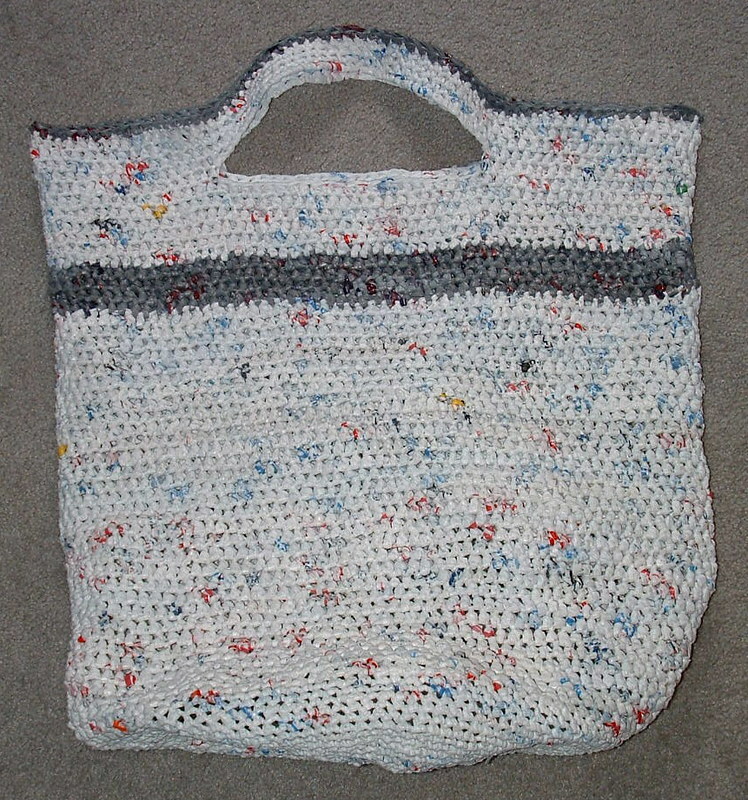 Speaking of which, this recycled bag may end up being the largest one I have ever crocheted and it’s taking a lot of time.